I remember a simpler time. A time when we didn’t discuss bandwidth or usage caps when talking about internet service. A time where the only limit on a person’s internet connection was their download speed. Those days are long gone. For several years now, Canadian internet providers have instituted bandwidth caps on all their plans. This shift was executed by all the major incumbent telecoms in a supposed effort to discourage “bandwidth hogs”. We were meant to believe that these mythical creatures who eat up and pillage bandwidth like rampaging hormonal internet termites were the bane of society and must be put in line with harsh penalties so that the rest of us don’t “run out of internet”. A few months ago the CRTC stepped in and invalidated a decision by the incumbent telecoms to increase their wholesale rates by 15% thereby making it impossible for the smaller ISP’s (who buy lines and bandwidth from the larger companies) to offer special unlimited bandwidth plans. While this was a small victory for consumer rights groups and Canadian internet subscribers in general, the CRTC’s ruling failed to address the key issue of bandwidth caps. However, OpenMedia along with Ottawa based CIPPIC (The Canadian Internet Policy and Public Interest Clinic) have recently made a submission to the CRTC on this very issue. The submission which can be found here explains how the UBB system is unfair, not economically optimal and based on false pretences. First, the submission argues that UBB is unfair despite its equitable appearance. “pay for what you use” seems to make sense until one realizes that unlike oil or timber, bandwidth is not a limited resource. There are infrastructure and maintenance costs associated with keeping up a network. However, those costs are not reflected in the pricing. Also, in reality, when a person is using a lot of bandwidth at a non peak time, there is no measurable strain on the system. Think of it as a pipe. When the general usage is low (say around 3AM) the pipe is nowhere near full pressure. Nevertheless, the user gets hit with the same penalty as a person using the service during peak hours. Second, the submission argues the UBB is not as economically effective as flat rate service. People don’t view internet on a usage basis. They view it in terms of the services they enjoy from it. In that sense, the internet to most people is a sort of “bundle” of services. Some economists put forth that the research on “bundling” denotes that a flat rate pricing model translate into higher revenues for ISP’s than a usage based one. Finally, the argument that UBB is meant to keep those pesky bandwidth hogs in line is false. The current pricing structure being implemented by the telecoms affects all levels of internet user. The proof is in the pudding. As per the monitoring report put together by the CRTC itself, as average usage has gone up, bandwidth caps have gone down. We aren’t talking about bandwidth hogs. We are talking about the average user who is being squeezed tighter and tighter as time goes on. What’s more, with the popularization of streaming services like Netflix, Hulu and Pandora coupled with the eminent shift towards web based “cloud” storage for media (discussed here), the average user will start to use more and more bandwidth. If things continue as they are, even average users will be forced to upgrade to more costly packages, pay for additional bandwidth on a monthly basis or suffer the harsh overage penalties. It is evident that the internet situation in Canada is broken and the CRTC seems to be hesitant to fix it. 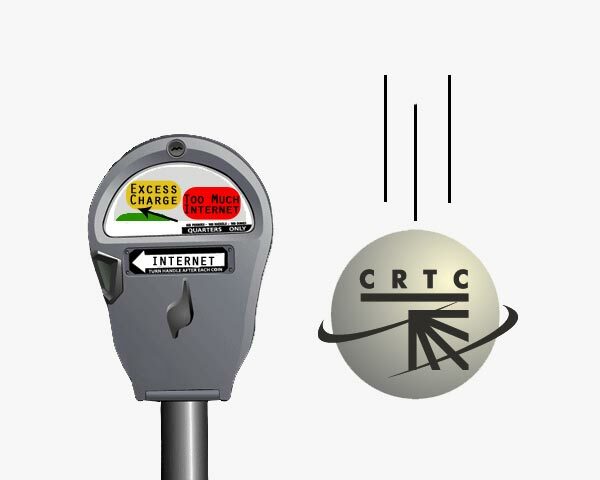 As far as administrative bodies go, the CRTC is rather powerful and has a wide mandate. It must, however, balance the interests of companies with those of consumers and does not generally engage in price fixing. Unfortunately for consumers, up until recently, all the best information was being held by the telecoms as no one really knew what their actual costs were. That seems to be changing. Submissions like the one made by OpenMedia/CIPPIC contains good and tangible research, the likes of which paint a very different picture than what the incumbent companies would have one believe. The question now is whether or not the CRTC will act, and act decisively.